How often do you get wet cycling to work? Cycling in Ireland is taking off. The DublinBikes scheme is a massive success with over 10 million journeys, there’s large increases in people cycling in Irish cities, there’s a good cyclist community, and infrastructure is slowing improving around the country. However, Ireland is a rainy place! It turns out that you’ll get wet 3 times more often if you’re a Galway cyclist when compared to a Dubliner. Dublin is Ireland’s driest cycling city. End Result: Percentage of times you got wet cycling to work in 2015 for cities globally. We’re wet, but 2015 was a particularly bad year for Irish weather. Here’s hoping for 2016! Overall, Ireland lives up to the wet reputation – we require raincoats and (very uncool) waterproof pants a bit more than many international spots! 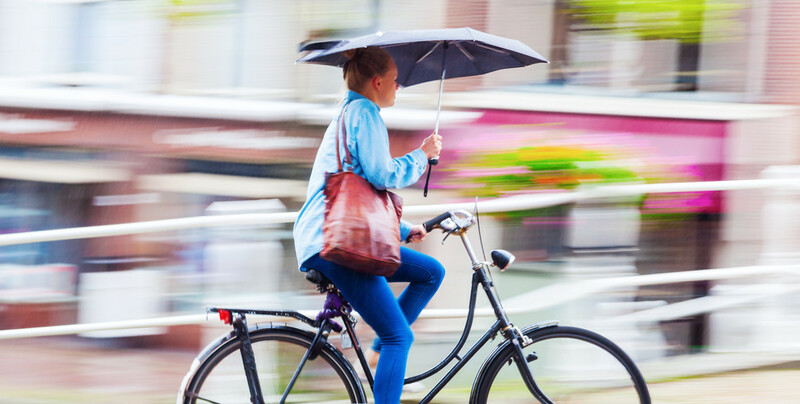 In this post, we examine exactly how many times cycling commuters got rained on in 2015, and we compare this to cities internationally. Data is taken from the Wunderground personal weather stations (PWS) network. If you’re interested in the techniques and repeating this analysis (Python, Pandas, & Seaborn) head here. Average Annual Rainfall across Ireland is heavily biased to the Atlantic Coast, varying from 600-800 mm in Eastern Ireland to over 3000 mm in the West. When do you cycle to work? Your cycle to work happens between 8.15am and 9.00am and you cycle home between 5.15pm and 6.00pm. If it rains at any time during these periods, with any amount, that’s deemed a “wet cycling day”. Unfortunately, Irish people are all too familiar with the “rainfall radar”! In 2015, it rained on 181 of the 365 of days at a weather station in Conyngham Road, Dublin*. Eliminating weekends and looking only at commuting times; in 2015, Dublin cyclists would have gotten wet 35 times, or 13% of their 261 working days! In Dublin, commuting cyclists got wet thirty-five times in the year, and very few of those wet cycles would have been a downpour. According to the data, Dublin cyclists had a completely dry February and a rain jacket was needed 2-3 times per month on average, even in Winter. Here’s a monthly breakdown of wet and dry cycles in 2015 for cycling commuters every work day in Dublin. The cycling commute in Dublin is not as wet as you’d think! Number of days monthly when cyclists get wet commuting at typical work times in Dublin, Ireland. Note the completely dry February, and the relatively even spread of days between winter and summer. *The rainfall figure is roughly in line with Met Eireann figures for Ireland, where we’d expect 151 wet days on the east coast and we know that 2015 was particularly wet. How does Dublin compare to cycling commutes in Galway, Cork, and Belfast? Belfast (Queens University) dripped on working cyclists 36 % of the time, or on 93 of their trips. Galway was our wettest city in the 2015 data, with 267 rainy days, and 115 wet commuting times. It doesn’t rain in the morning or evening as much in Cork. Even with 221 days with rain, commuters were only rained on 67 times (27%) of working days. Belfast is wet 236 days of 365 in 2015, cyclists were wet on 35% of their commutes. * Note that the Cork station at Blackrock was missing about 20 days data in June 2015. Could you just cycle to work at a different time? An interesting way to look at the data is to examine how many hours in the day is rain actually falling. If you had a very flexible workplace, could you just dodge the rain!? We can look at the number of hours per day during which rain was recorded. As a visual, you can see variations between the cities in Ireland, and that we clearly need raincoats year round. How many hours a day does it rain in Dublin, Belfast, Cork, and Galway? Darker colours represent more hours with rain – with the darkest red being 24 hours. Unfortunately for the westerners, Galway fared worst here too. Although there is a chance that the particular weather station chosen is in some sort of bath/shower…maybe. How does Ireland stack up for wet commuting globally? Looking at 2015 rainfall data from 18 cities globally, Ireland doesn’t fare well. Galway consistently tops the charts in 2015. The graph below compares 19 international cities. Moving to Madrid anyone?? Percentage of times you got wet cycling to work in 2015 for cities globally. Galway comes out consistently as one of the wettest places for a cycling commute in the data available, but 2015 was a particularly bad year for Irish weather. Here’s hoping for 2016. A look at the rainfall filled hours in some of the international cities obviously shows some stark differences to our Irish homes, and also that these cities have a very defined seasonal variation in weather patterns. We can take some solace that we’re not alone – our Scottish friends also stand out for rainy cycles. Internationally, rainfall varies a huge amount between seasons. Overall however, Irish cyclists get a rougher deal! One issue that’s been pointed out with this analysis is that it rarely actually takes a full 45 minutes to cycle to/from work or school. Hence, there’s a potential flaw in the analysis in that any rain in the commuting periods makes the day “wet”. Reducing the definition of a wet day to “a day in which there is no dry period 20 minutes at commuting times” might fix this issue – and would likely reduce the percentage of wet days across the board for all cities. If this analysis is completed, it’ll appear here. The data for this article was collected and plotted from weather stations at Wunderground using the Python programming language, specifically using the Pandas and Seaborn libraries. If you’re interested, you can see the details, and how to repeat the analysis, over here. The raw data is also available here, if you’re keen on that sort of thing! RTE1 Ray D’Arcy show on Wednesday 6th April at 3.10pm. So the definition of a wet cycling day given is if it rains at any time between between 8.15am and 9.00am or 5.15pm and 6.00pm. I would wager that cycle commutes in Galway are less than half the duration of those in Dublin. You don’t seem to have gathered data or adjusted for that fact. It is eminently possible to commute between showers in Galway and on misty days a light normal jacket suffices for commuting as you’ve usually reached your destination before you get wet. A good point Colm, well made. You could argue either way on that one – while Galway may be smaller for getting around, population density is potentially higher in Dublin, which may negate the distance effect. I tried to quantify the “amount of time actually raining” in the heatmaps, but it was difficult to go to a lower resolution (per minute etc). There’s also the chance that the particular weather station i chose is wetter (its on the west side of town). The raw data is there if you would like to have a go – and I’ve posted the code too. Let me know if you find anything! I found commuting between showers in Galway close to impossible over a few weeks in 2015 when I was working at Parkmoore West Biz Park and had to get into Dangan. That’s flat 10 kilometers and the options were to get wet at the office and into Tuam Road, then again just past the Westwood Hotel at Upper Newcastle Road or leave the office dry and get the lashing around the bend at Terryland. Whichever way, “dry” was not an option there, but would’ve been on a shorter commute of 5-6 kilometers. Interesting stuff Shane! However, we have it easy here…….I was recently in Uppsala (Sweden), where the dominant transport mode is bicycle and they get a lot of SNOW, but it doesn’t deter them in the least. I asked a (fiarly heavily) pregnant lady was she not nervous cycling in the snoe – she replied: I slip less on the bike than walking! However, when you compare the commute time (and consistentcy of commute time) by bike, compared to car and public transport (and you get always get a seat on a bike! ), then it’s not to tough to put up with a little H2O ! John! Good to hear from you. How did this find its way to your desk!? Might be worth a repeat of the analysis taking some of the Nordics into account! I’m with you on the cycle to work, and its a satisfying feeling passing by traffic-jammed cars!! We’re lucky it seems here on this coast. I haven’t been wet this year yet. I hope all is well in Maynooth. I’m back out there this Friday 6am for the Galway cycle once more! Hi Shane – I have regularly cycled to and from work for years in Ireland and as you rightly point out get wet very rarely. If I get out of bed and it’s raining I generally ditch the bike – probably only stops me cycling one day out of 10 – 12 during the winter and hardly at all during the summer. The only thing that has made me think twice about it lately is the increase in incredibly aggressive traffic and ubiquitous smart phone use. thanks for doing this Shane. I’ve been motorbiking for years in Dublin and reckon I only get absolutely drenched about 10 times a year. When I cycle my 9km commute that might go up a bit but not by much as doing it on a motorbike is only about 7-10 minutes quicker than by bike. Anyway I’ve been saying to car driving friends for years that two wheels is the way forward and that it isn’t anywhere near as wet as what people think. Your research goes a long way to proving what I had already thought on the matter, fair play to you for taking the time to put it together. Thanks Derek. I’d had the same conversation with friends a few too many times, and I may have gotten a bit over enthusiastic here! Just waiting now for someone to bring up again … “do you not get soaked?”. They’ll be in for a (perhaps overly!) well-informed reply! Good question James! I only had a chance to look at total number of hours of rain per day, as you can see in the heatmaps. But there’s loads of other interesting approaches. The data is is there, formatted to sub-hour amounts if you’re keen! I will see if I can return to the subject later in 2016! Nice work Shane. What’s interesting to me is that Amsterdam (the city with most per capita bike use) is ‘wetter’ than Dublin – I expected it to be much less so. Might that have something to do with different definitions of ‘wet’ and ‘need a raincoat’? Another factor could be the average commute time (much shorter in AMS). Hi Pieter – good point. I think there is definitely something there. The analysis could also improve with finding a 20minute dry “gap” in which to commute. If I revisit, I’d love to add these details, but for now unfortunately, I had to publish rather than wait for more analysis time! Why no data for a cycling commute in Waterford City the “sunny south-east ???? amazed at the ommission. Haha thanks Brian. Unfortunately there’s not a lot of Personal Weather Stations (PWS) to choose from – though to be honest I didn’t have a look in Waterford. If you can find one with sufficient detail in Waterford, I can add it in the next iteration! It would definitely be interesting to see if the Sunny South East lives up to the reputation. Great analysis – thanks for putting it together. Is there any way to quantify amount of rain? E.g. If it’s just a very light 5 min rain, and you don’t need any special clothes, it’s quite different than a full rainy day. Would be great to see Copenhagen in there too, as it’s also got a similar climate to Dublin, and like Amsterdamn, also a huge cycling city. Its a good point Kevin, I think there is room to improve here on the definition of “wet”, away from “any rain at all”! Would make a big difference as I think Ireland gets quite a lot of “not heavy” showers. Copenhagen would make a good addition – the difficulty is finding PWS stations that have sufficient data (minute-level records for the full year). If I revisit, I will add the extra data point! Hi Shane with the Waterford Greenway opening soon and the St.John’s Greenway ( linking the southern suburbs to the city centre and Tramore routes) it will be important to be included in any future studies here’s a great weather station based in Waterford City which has 6 years worth of data for you http://www.waterfordcityweather.com/template/plugins/stationExtremes/index.php many thanks Brian.